French photographer Xavier Hubert-Brierre set up a large mirror and hidden cameras in the Gabon rainforest to see how animals would react to their reflections. He would rub his reflection, coating the mirror with the oils that protect his fur, grease from of his paw pads and dribble. During one of his visits cameras caught the leopard being interrupted by a herd boisterous elephants. The herd chased him off but did not seem as enamored with their own reflections as the elegant big cat was with his. The group did not recognise themselves in the mirror. They frantically ran around the reflections before becoming too spooked and sprinting off into the forest. 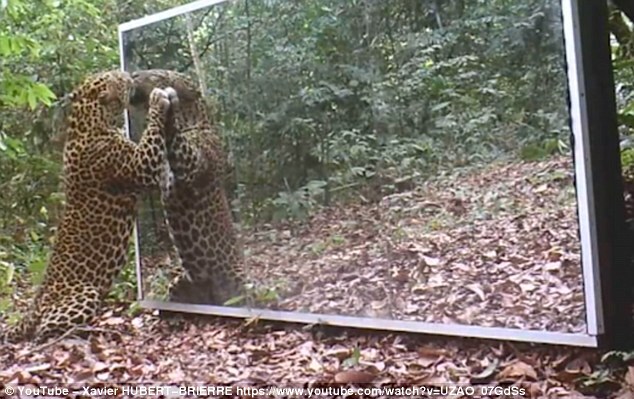 Responses to "Wild Leopard Obsessed With His Reflection in Jungle Mirror"